Good morning! Have you ever purchased a stamp set and immediately had an idea of what you wanted to do with it? Well I sure did with my new Thankful Forest Friends set! The problem was that all my ideas were falling flat. I fussy cut so many bears and foxes that my hand was cramping! But I loved this set and this week's SIP Challenge is all about Cardmaker's Choice and I just knew I wanted to use this set, it was my choice, right?? Well after a lot of playing around with my fussy cut bears and foxes I decided that my bears needed a forest, after all they are Thankful Forest Friends. Then it came to me..... I had a die that I bought last year with some cool pine trees. So I pulled out my never used die that I just had to have last year and cut it out in both Old Olive and Early Espresso so I could cut and piece together so my pine trees would have brown trunks. Here's what I came up with after all of that playing around. I started with an Early Espresso A2 cardbase. I added a layer of Soft Sky cardstock and a couple of Old Olive stitched hills. My Old Olive Pine tree die cuts were sponged with Old Olive Ink to give the trees some dimension. I made a banner for the bears to hold with a sentiment from the Lighthearted Leaves stamp set and did a little surgery on the Bears arms so they could hold the sign. After surveying my card, I decided I needed something at the top so I punched a couple of Whisper White clouds out with the Tree Builder Punch. Well there you have it.. all done! Now I have to figure out what to do with the Cajun Craze foxes I fussy cut and never used! Hope you have a Fabulous Day and head over to SIP and link up your own card. 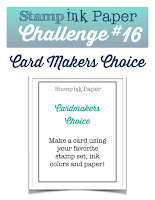 After all, this week is Cardmaker's Choice so you can make any card you want to make! It's all up to you! Adorable! I love your little forest scene and the bears holding the banner! Awesome Tina, love the scene you created with the bears. Have a great weekend.